I’ve always envied those Thanksgiving Day hosts who rely on their guests to provide the feast. In conversations with these delegating divas they politely inquire as to my menu. I rapidly fire off the recipes with the precision of a drill sergeant. “All I really have to worry about is cleaning the house,” they reply to me gently, shaking their heads at my seeming naivety. All week I’ve been studying lists and mapping Thanksgiving strategy as if preparing for defense against some perceived threat. My family and friends know how to wield chef knives, I never hesitate to host a potluck, so what genetic tick insists I make all the food for Thanksgiving? 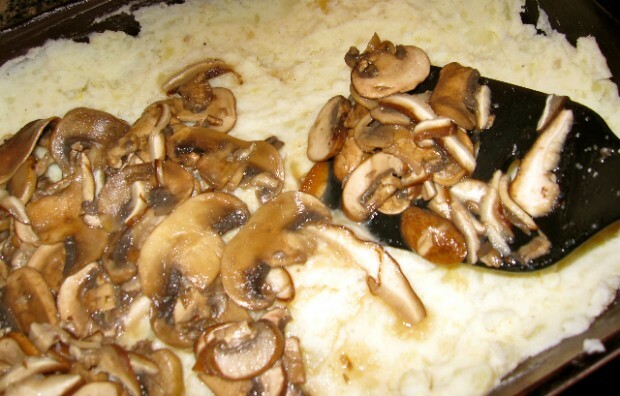 Mushroom mixture is sandwiched between 2 layers of mashed potatoes. This family favorite is a great make-ahead for cooks such as myself, who insist upon tackling the whole feast, yet don’t want to scurry around mashing potatoes at the last minute. It’s a recipe for the Type A personality that tells their guests, “Oh, it was nothing,” yet took 3 days of vacation time to organize the menu, still dropping the kids off at day-care. Roasted Garlic Mashed Potato & Mushroom Casserole has your number, as well, if you’ve been delegated by the savvy host to bring a dish. It can easily be made 24 hours in advance, wrapped, refrigerated, then popped into the oven right before serving. Cut off pointed end of garlic head and drizzle exposed cut cloves with olive oil. 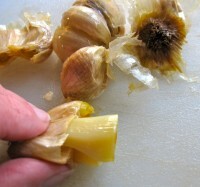 Arrange garlic in on a double thickness of foil, cover with foil and seal edges tightly. Roast garlic on the middle rack of oven for about 40 minutes or until very soft. Cool, then squeeze garlic from skins. Reduce oven temperature to 350˚. While garlic is roasting, bring large pot of salted water to a boil. 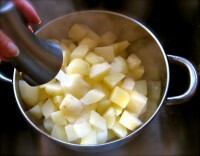 Peel potatoes and cut into 1-inch chunks. Boil for 10 to 12 minutes or until tender. Drain. Mash potatoes, roasted garlic, butter, sour cream and half-and-half or milk until smooth. Add more half-and-half or milk, if necessary, to make a creamy mixture. Stir in basil and season to taste with kosher salt and freshly ground pepper. Reserve. In a 9X12-inch baking dish, evenly spoon 1/2 of mashed potatoes, spreading evenly with a spatula. Evenly layer leek and mushroom mixture over potatoes and top with remaining potatoes, smoothing with spatula. Sprinkle casserole with 1-2 cups grated cheese, according to taste. Cover casserole with lightly greased foil and bake 30 minutes. Remove foil and bake an additional 15 minutes until cheese is lightly browned and bubbly.